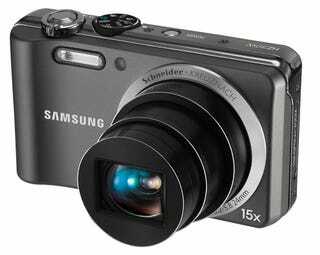 The HZ35W is a rare compact camera with 15x optical zoom. The wide-angle 24mm Schneider lenses are coupled with 12mp sensors, and the HZ35W has a 3-inch AMOLED screen along with GPS for geo-tagging. The HZ30W on the other hand has a 3.0-inch TFT LCD, so won't offer a battery life quite as long as its bigger brother. Video recording is done at 720p and 30fps. These two go on sale in March also.